When you need to get around in the winter, the right vehicle is required. For an option sure to give you safety, stability, and the right amount of speed, a snowmobile is the only solution for winter travels across snowy ground. With our selection of Polaris snowmobile accessories, find everything you need for your favorite model to ensure the best winter yet. We offer a wide selection of Polaris snowmobile accessories to fit your needs with ease. Whether shopping for a 2000 year or a brand-new model, we have you covered with all the must-have items for this vehicle type. With a focus on catering to a wide range of needs, you will find such top models as Indy, ProRMK, Voyageur, Titan, and more, to ensure you always get the solution tailored to your specific model for a hassle-free shopping experience. We offer only the highest quality in terms of materials and manufacturing standards, so rest assured every option in our Polaris snowmobile accessories is a high performing choice built to last. Aside from the quality and range of models covered, you will also find a wide scope of product types available. 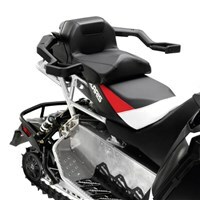 Whether looking for covers, racks, storage bags, or seating options, we have it all right here in our wide selection of Polaris snowmobile accessories. From carbide sharpeners and skis to receiver hitches and snow shovels, we are confident you will find the right product for whatever your need may be. We even offer all the essentials you need for your favorite winter ride in the form of interactive digital displays, electric starts, and more. From handles bars to windshields, we have it all in one convenient place. Find exactly what you need today with our inventory! Here at Polaris Parts Nation, we are committed to customer service from start to finish. Please contact us with any questions and we will gladly assist you further.